An Urban/Industrial Vacant Lot... Transformed! 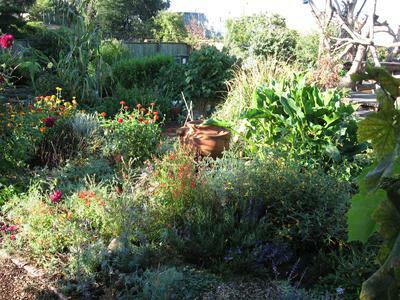 This school garden site operated for about ten years and was operated by and located a block away from Duck's Nest Preschool in Berkeley, California. Many of the resources on this site are from my time there. I was the Garden Teacher for eight years and if you have any further questions about this program feel free to contact me at the email at the bottom of this page. This garden was funded by the preschool proper (Garden Teacher's salary, land lease, port-a-potty rental, art and other supplies) and the parents, largely through fundraising efforts by the Duck's Nest Parents' Association. Depending on their funds, they may provide a monthly allowance or funds for special projects or equipment. This tile wall funded initial projects; families donated money to paint the tiles. This garden was previously a vacant lot. It was owned by Haws, which had a water fountain-making company. There were three small houses/businesses, a very large warehouse, a grassy lot, and a parking lot on the property as well, which altogether took up about half a city block in an industrial neighborhood. The lease was offered to us very inexpensively because the Haws family had many family ties with the preschool owner's family. The vacant lot was covered in crushed gravel and was a storage site for boats, cars, and a huge, broken-down trailer. Initially, the garden started out with a small play structure and eight raised beds on top of the gravel. Fortunately for us, a husband signed his wife up to be on our Garden Committee when their son started at the preschool. It just so happens that she knew all about landscape design and she and her husband have designed special exhibits all around the world, including Lookout Cove at the Bay Area Discovery Museum. During her tenure at the preschool (three years), she designed the garden and hosted numerous fundraisers and work parties to get the garden built. The school itself is one block away. It has been running since 1985 and the owner lives on site. It is a large school, licensed for 91 2-5-year-olds each day. There are five classrooms with 17 teachers, three administrators, and one custodial staff person. Classrooms are divided by age. One whole house is devoted to all the two-year-olds, one classroom each for three-year-olds, three-and-a-half-year-olds, and four-year-olds, plus a small house for the four-and-a-half-year-olds. Each class had a "garden day." The children are dropped off at school and the teachers bring them all to the garden when they're ready. They usually eat snack in the garden. The children eat lunch in the garden, weather and age of the children permitting, and go back to school for rest time. Full-time children come back to the garden in the afternoon for pickup. There was once one full-time garden teacher, but the school cut funds for the work to be from 9:00-1:00 only. Each classroom had "garden room parents" who signed up at the beginning of the school year. These room parents helped organize work parties and play dates (usually a weekend potluck brunch in combination with maintenance work). This tree is of special importance. I chose to plant this coast live oak because I researched what trees would be of significance for this site. I imagined it growing slowly, providing habitat to native animals and eventually growing big and strong enough for the school's children's children to play on its branches. The children in the oldest classroom helped dig the hole, which eventually was big enough to hold a couple of the kids. We planted the tree together and the children built the little brick wall at its base to protect the tiny trunk from running and playing children. When a developer purchased this land and proposed to build houses I felt devastated. The urban children using this land, I thought, had lost their space for nature connection and the oasis of native plants and insects would no longer provide fodder to garden and migratory birds. Little did I know, however, that this tree would remain. Nurtured and cared for, it reached the minimum circumference to be protected under the City of Berkeley's moratorium on removal of coast live oak trees. An unanticipated act of environmental justice by our preschool group, planting and protecting a tree of significance. It is my hope that others will plant more of these trees around Berkeley and other cities can adopt similar ordinances for trees of importance for their native habitats. I photographed the coast live oak from the parking lot behind the garden space in April, 2018. Housing construction had not yet begun and the site was rife with insects flying and birdsong. I felt proud to see how the plants I planted and the site I worked so hard to maintain in a way that was harmonious with nature continued growing healthily all on their own. The tree had received a strange pruning job, but stands proudly and will continue growing for a long time to come. By Heather Taylor, teachoutside@gmail.com. You are welcome to share all materials with credit to her.